Out of the Sling Today! Yea! I am out of the sling and on the way to full motion with the left arm. I can type normally now and will be getting back to all the stuff that has been piling up over the last three weeks. From an Ambush Alley Games perspective, I’m working on several scenarios for the upcoming Force on Force Special Ops book. I’m also writing an article/After Action Report based on of the scenarios from Cold War Gone Hot for Miniature Wargaming magazine. From a personal perspective, I’ve dusted off my Viking rules to start polishing again after the last playtesting. 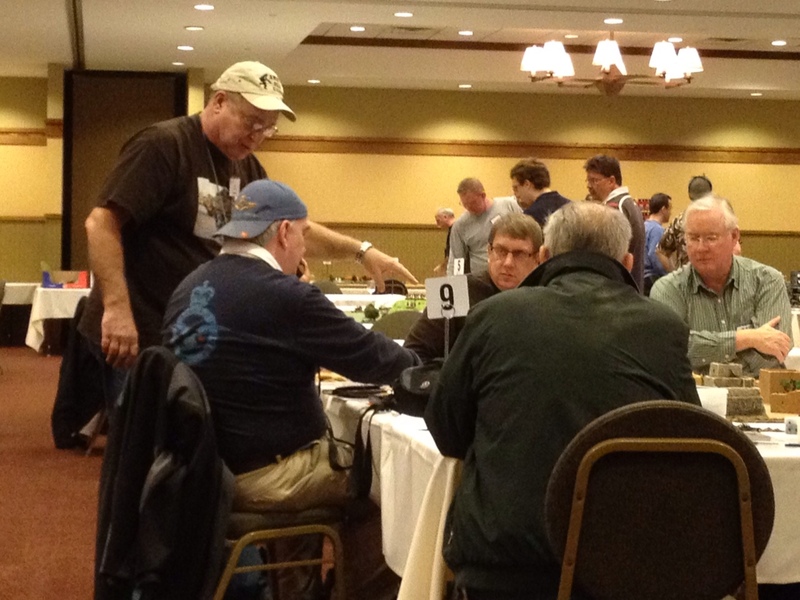 I’m also helping Skip Peterson put pen to paper on his Legends in the Skies WW2 dogfight game. Painting is still a few weeks off since any rotation of the left forearm is still very painful. Overall, I am quite pleased by the early feedback. Most of the criticism is for a few typos and the desire for more content (always a challenge in this industry), but everyone seems to like the three-part format and the “Hollywood-style” scenarios. I am very honored to have worked with such a great team — Shawn, Rich, Jim and Piers, as well as the many other contributors. 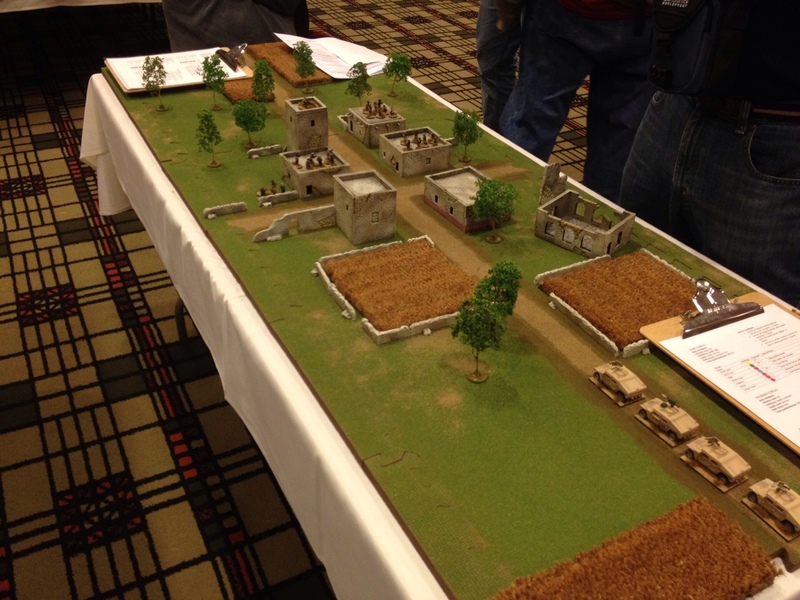 Dixie did a great job with the maps and my thanks to Osprey Publishing as well. I only hope the next book I’m working on turns out as well. 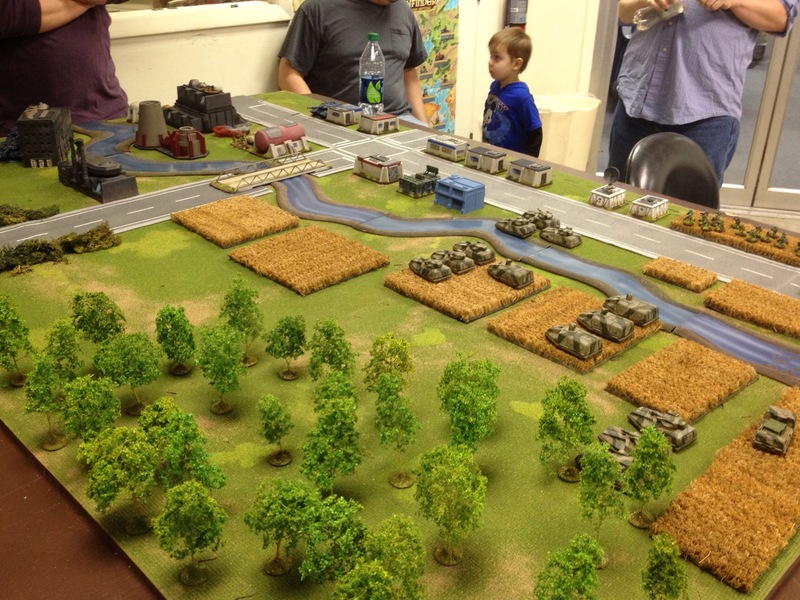 We’ll be following up our successful game from two weeks ago with a series of smaller Tomorrow’s War games at Games Plus this Sunday, starting around 1 PM. Why the smaller games? We’re play testing a draft of a points system that Shawn Carpenter and I have been working on to answer the many requests we’ve received. I’ll be mostly floating from game to game and observing, taking notes, asking questions, etc. Given my crazy weekend (tons of errands, snow shoveling, massive cleaning in the house and band rehearsal), I didn’t get a chance to organize before heading over to Games Plus on Sunday afternoon to run a Tomorrow’s War demo. Looking through the figures I brought and that Zach had on hand, we decided on an assault by a Neo-Soviet force against a US Army defensive position comprised of a small settlement surrounding an industrial area. The Neo-Soviet attackers were a large force consisting of a company of 9 Pegasus III tanks, moderately armored and gunned; a platoon of mechanized infantry in hover APCs; another platoon of VDV troops in tracked APCs and wearing TL2 Power Armor; and a tracked tank hunter attached to the VDV forces. 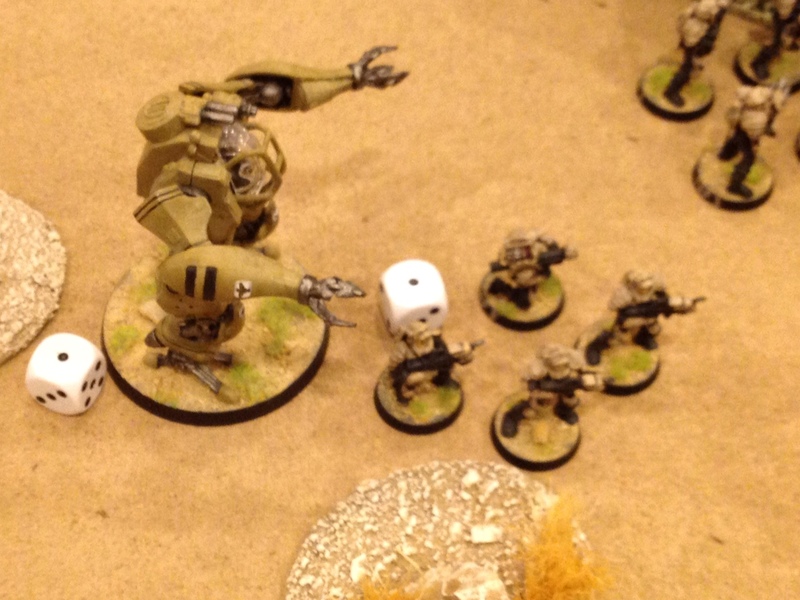 All troops were TQ:D8/Morale:D8, except for the VDV, who were TQ:D10/Morale:D10. 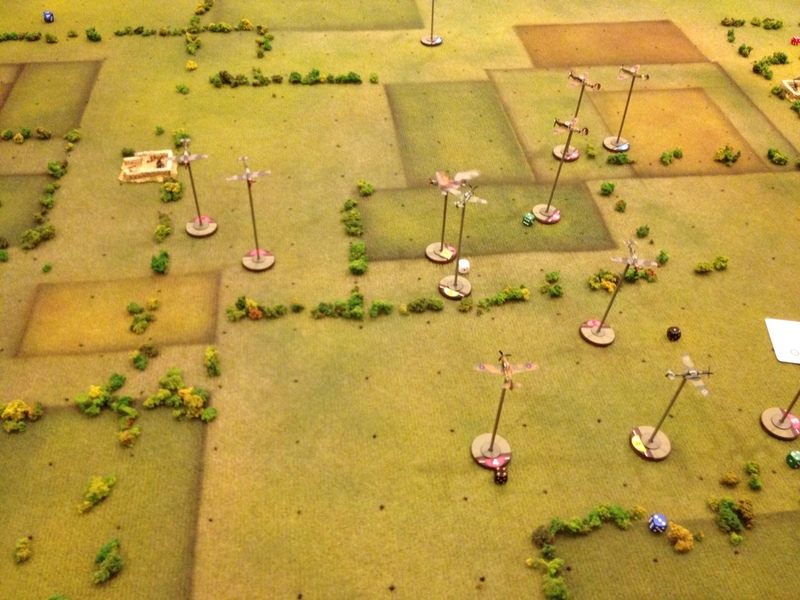 The Neo-Soviets set up second and had initiative for the first turn. The US defenders comprised 3 Patton Heavy Tanks (also known as the Khurasan Siler tanks), 3 Ramirez IFVs, two squads of infantry and a weapons squad with 2 AT teams. 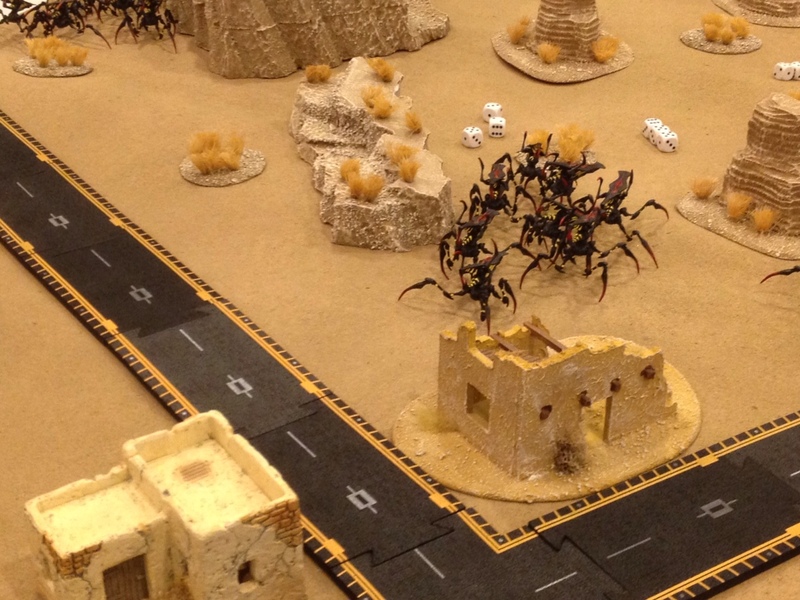 All troops were TQ:D8/Morale:D10. We also gave the US tech level 3 and plasma weapons (negate one die of armor) to give them a better chance at holding off the Neo-Soviets. The US players had to set up first. 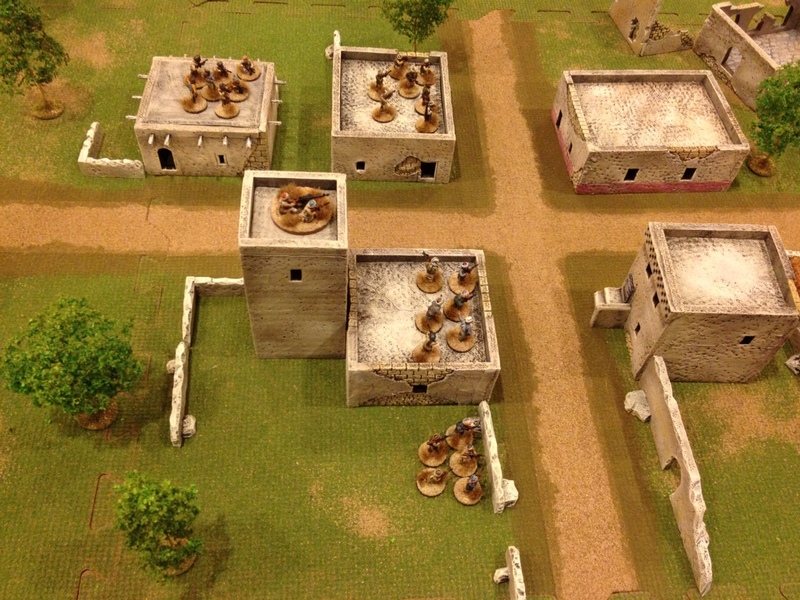 The village provided 1 extra die of cover in each building, 2 extra dice in the industrial buildings. The scenario objective was simple. Add up the number of buildings controlled by each side when time expires and the highest total = the winner. 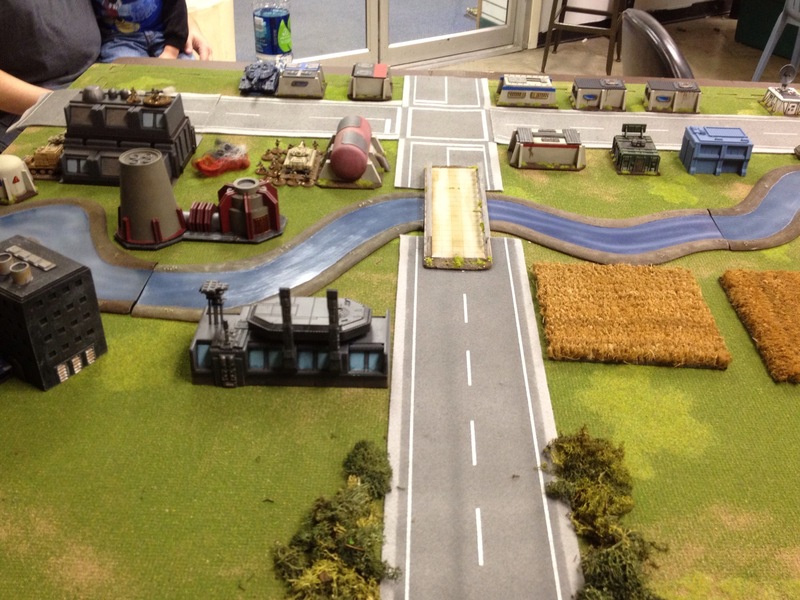 The settlement...the US players set up to the left of the road, the Neo-Soviets came in from the right. I should have known things would not go as I thought from the first turn. 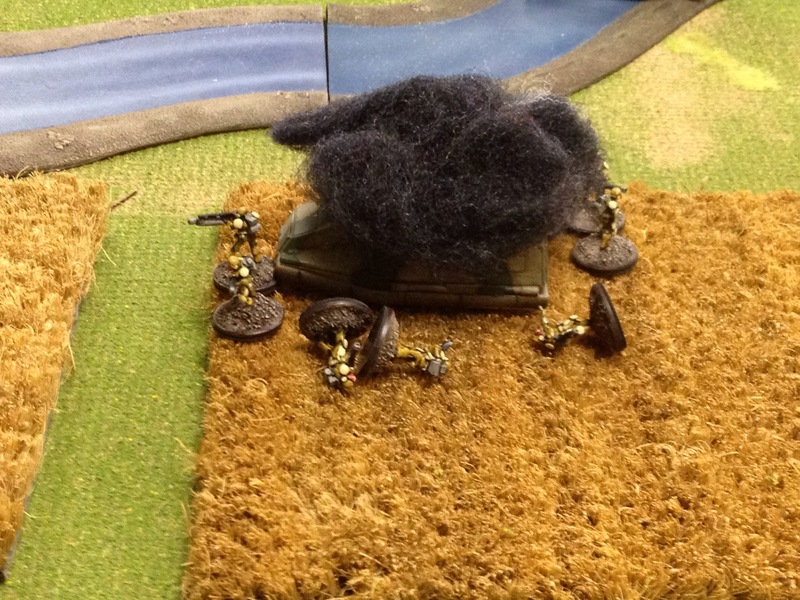 The Neo’s pushed one flank hard right from the start, using one platoon of hover tanks to fire smoke (pretty ineffectually, I might add) and then pushed forward a second platoon who drew reaction fire from two of the Pattons. That’s when things went…weird. 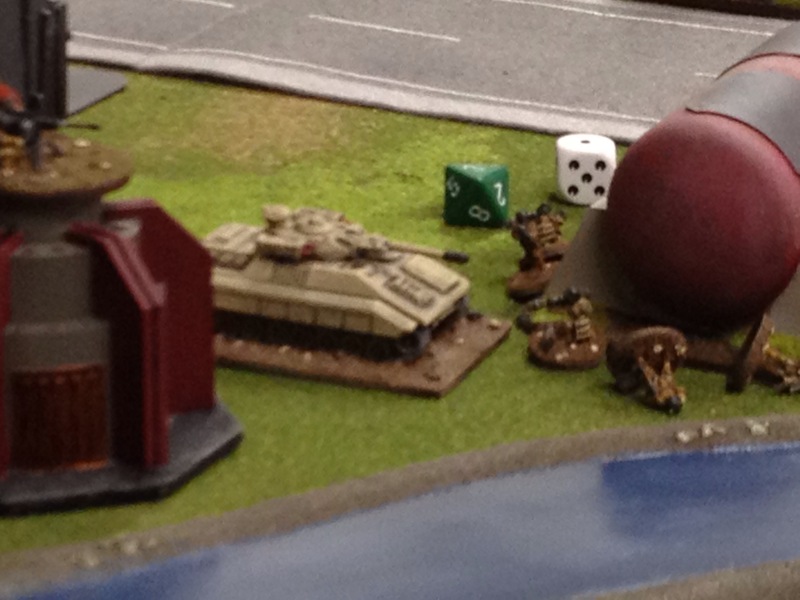 The first thing that happened was a Patton fired a round into a Pegasus for a quick kill. 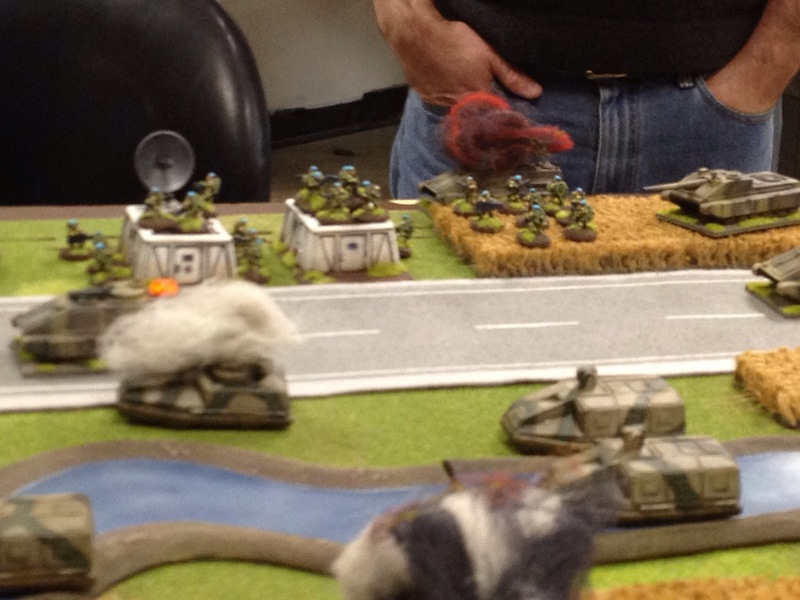 During the subsequent turn, another Patton rolled into view, and lost the draw with the surviving two Pegasi. One missed, but the second one rolled two hits with 2D8s. The frontal armor for the Patton is normally 5D12, but it was up to 6D12 because of the lower tech level of the Pegasus. Guess what? 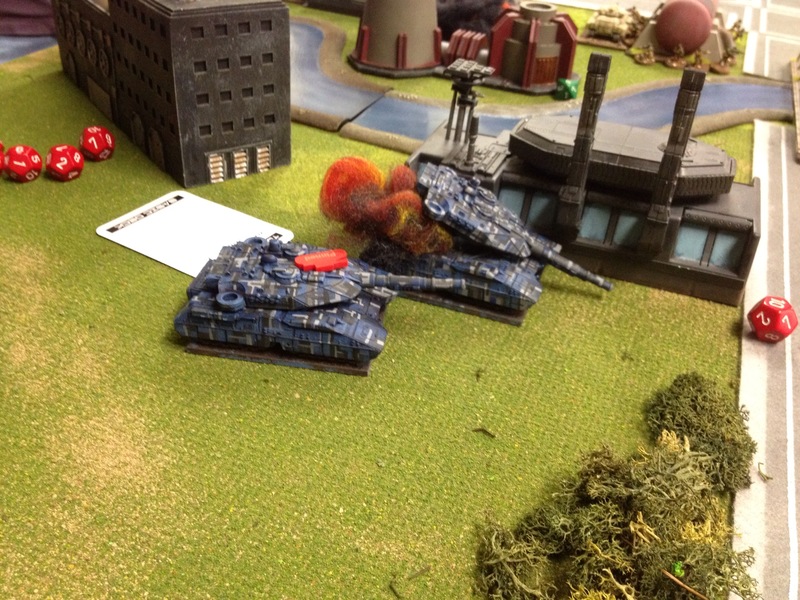 A hit, and one that proved critical: main gun knocked out. My son Steve (commanding the Pegasus in question) let out a whoop of glee! A second Patton rolled out to engage the platoon firing smoke. Moments later, the unthinkable happened again. 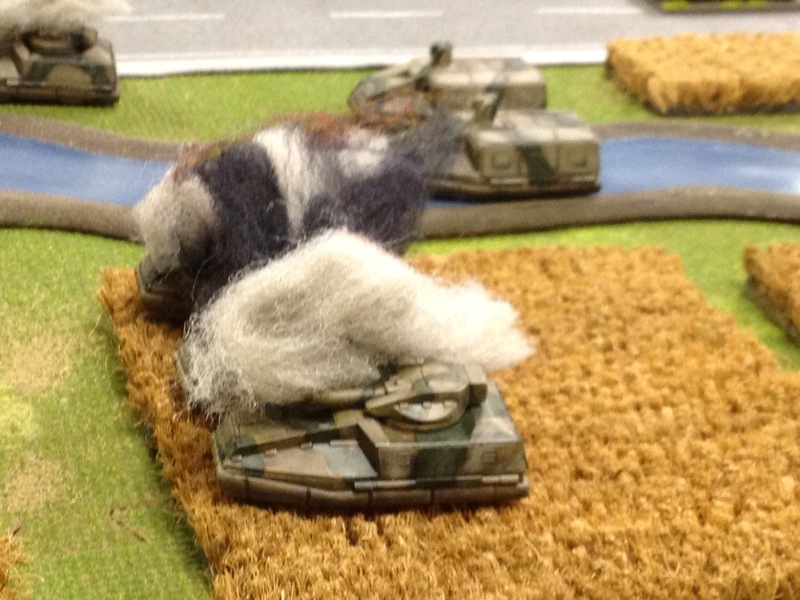 The Patton lost the draw, but this time the return fire from a Pegasus knocked out the vehicle entirely. Harlow (commanding this Pegasus) had trumped my son’s achievement! One burning, one main gun knocked out...one weird day! 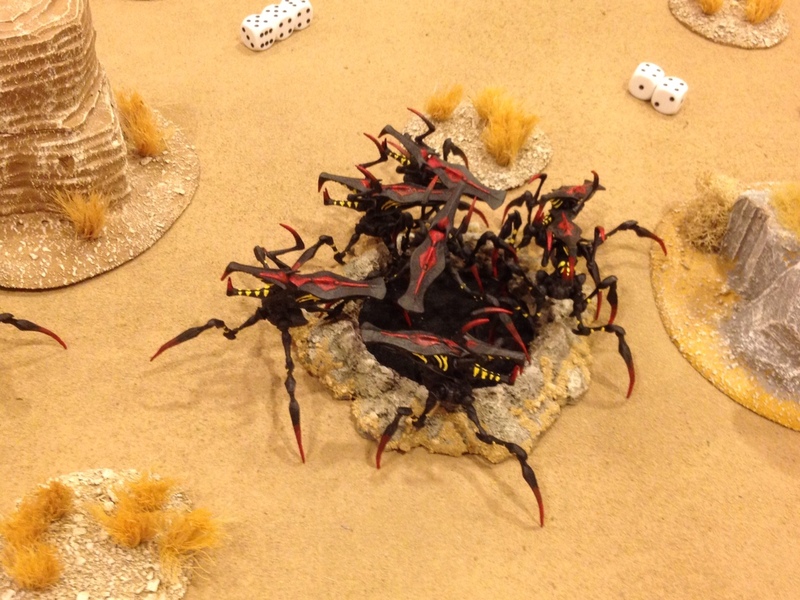 After this, the US players hunkered down and kept in cover. The wounded Patton decided to fire at APCs and infantry targets, while the sole remaining intact Patton stayed in cover for the most part, waiting for the Neo-Soviets to close. The Neo-Soviets did just that, but at incredible cost. The AT teams, along with the Ramirez APCs, played hell with the Neo-Soviet APCs, brewing up many and causing casualties among the dismounting infantry. On the Neo-Soviet extreme right flank, the VDV dismounted and advanced rapidly to take the first row of buildings, taking fire and light casualties, but putting it to the US defenders. It was at this point that time ran out with the issue very much in balance. 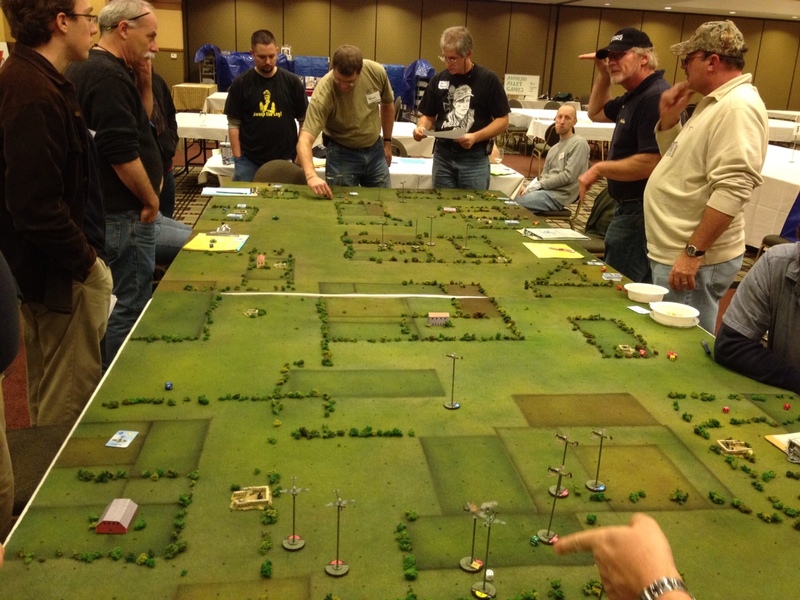 From a “buildings occupied” perspective, the US players were in the lead, but the VDV were chewing up the US infantry and not taking much in return. All in all, it was a fun game with plenty of momentum shifts and thrilling moments. It just goes to show you that what looks like a balanced scenario can go to hell in one turn. But unlike other games, Tomorrow’s War doesn’t necessarily stay that way, as the US forces did a very effective job of turning the situation around and making it a very close game, despite the early losses. 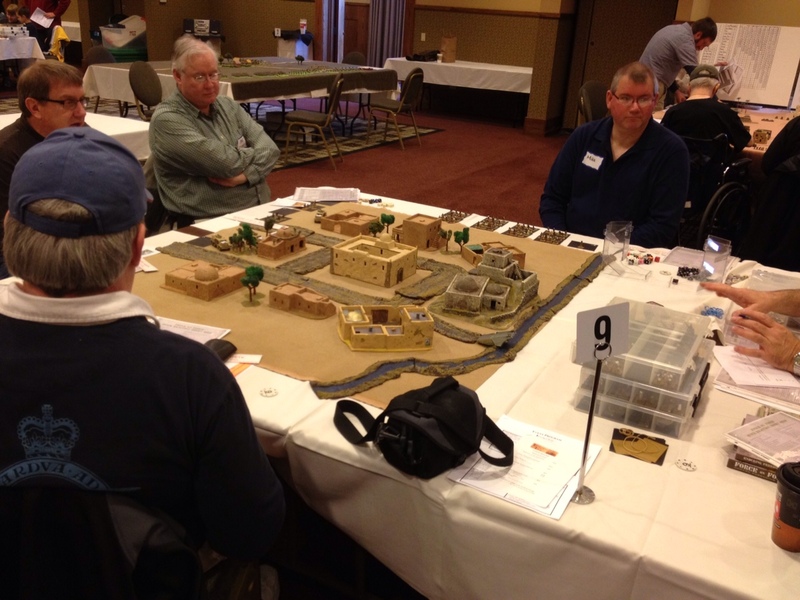 Late breaking announcement: I’ll be running a game of Tomorrow’s War at Games Plus in Mt. Prospect, IL this Sunday afternoon. I plan on being there at 12 PM with game time somewhere around 1 PM. I haven’t decided what exactly it is that I’m running yet, but most likely it will be the Bugs in the Reactor scenario from the main rulebook. Rett will also be running a game, so we should be able to accommodate plenty of players. Hope to see you there!